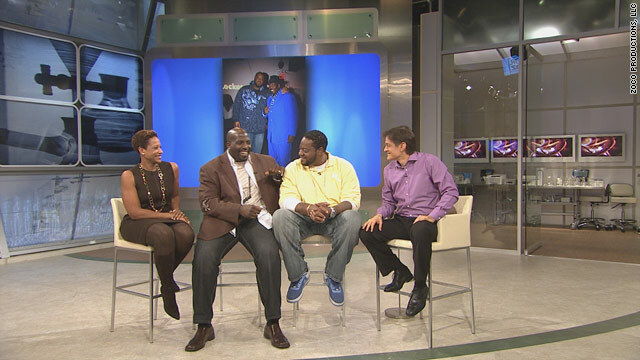 Actor Grizzwald "Grizz" Chapman, second from right, told "The Dr. Oz Show" he is in need of a kidney transplant. Chapman will continue to appear on "30 Rock"
(CNN) -- Beloved "30 Rock" cast member Grizzwald "Grizz" Chapman is undergoing dialysis treatment while on the wait-list for a kidney transplant. The 6-foot-11, 378-pound actor who plays one-half of Tracy Morgan's security detail on the Emmy-winning show is suffering from severe hypertension that has him on a dialysis machine three times a week. Chapman must lose more than 75 pounds before he can be considered a viable candidate for a transplant. Once he loses the weight, he could remain on the transplant wait list for up to five years. In a bid to get healthy in anticipation of surgery, Chapman is working with Dr. Mehmet Oz of "The Dr. Oz Show." The actor opened up to Dr. Oz, who is working to create a plan that will help him shed the pounds, on an episode of the daytime program that will air on Tuesday. Chapman admitted to Dr. Oz that he ignored his high blood pressure and even refused to take medication for it for more than a decade. "Well, in the beginning I didn't take the blood pressure medicine, because listening to my friends, my friends told me, you know, if you start taking the medicines, you'll be on the medicine for the rest of your life. ... I just kind of brushed it off and, you know, continued on my, my normal everyday life," Chapman said on the show. Chapman was joined on the set by his television sidekick, Kevin Brown, who portrays "Dot Com" on the show. "He's getting that transplant!" Brown said. "I'll lose the weight with him. For every 10 pounds he loses, I'll lose one pound. That's a deal!" Dr. Oz has assembled a team of medical experts to help Chapman take the right steps to stay healthy until a kidney becomes available for him. A spokesperson for NBC said Chapman will continue to appear on "30 Rock" while he is undergoing treatment.